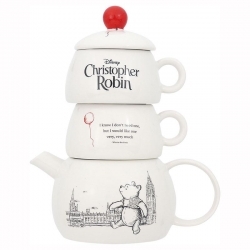 Christopher Robin and his best friend Winnie the Pooh both love to share a cup of tea with their friends, Piglet, Eeyore, Kanga, Roo, Rabbit, Owl and Tigger. Tea with HUNNY of course. And a biscuit. Don't forget the biscuit. 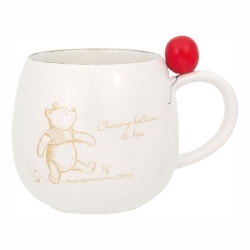 Christopher Robin & Winnie the Pooh Hug Mug, "Chasing Balloons & Bees". Gift boxed. Licensed Disney product. 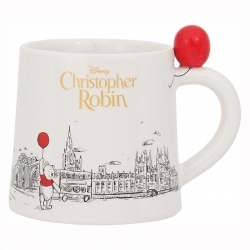 Christopher Robin & Winnie the Pooh in London red balloon mug. Gift boxed. Licensed Disney product. Teapot with infuser. Height 12cm. Gift boxed. Licensed Disney product. 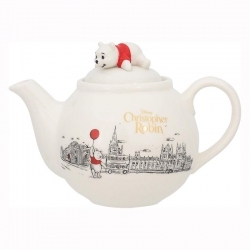 Christopher Robin & Winnie the Pooh teapot. 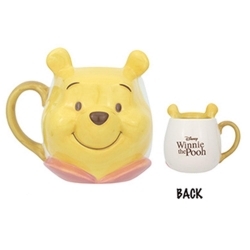 350ml Winnie the Pooh Face Mug. Height 11cm. Gift boxed. Licensed Disney product. 350ml teapot with infuser. Gift boxed. Licensed Disney product. 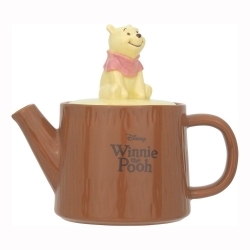 Winnie the Pooh is sitting "on" the 100 Acre Wood.